While food is the focal point of any dining adventure, good ambiance and an exceptional setting can elevate the experience. Whether you’re eating out with your lover, friends, or coworkers, you want an environment that facilitates lively conversation and good times. 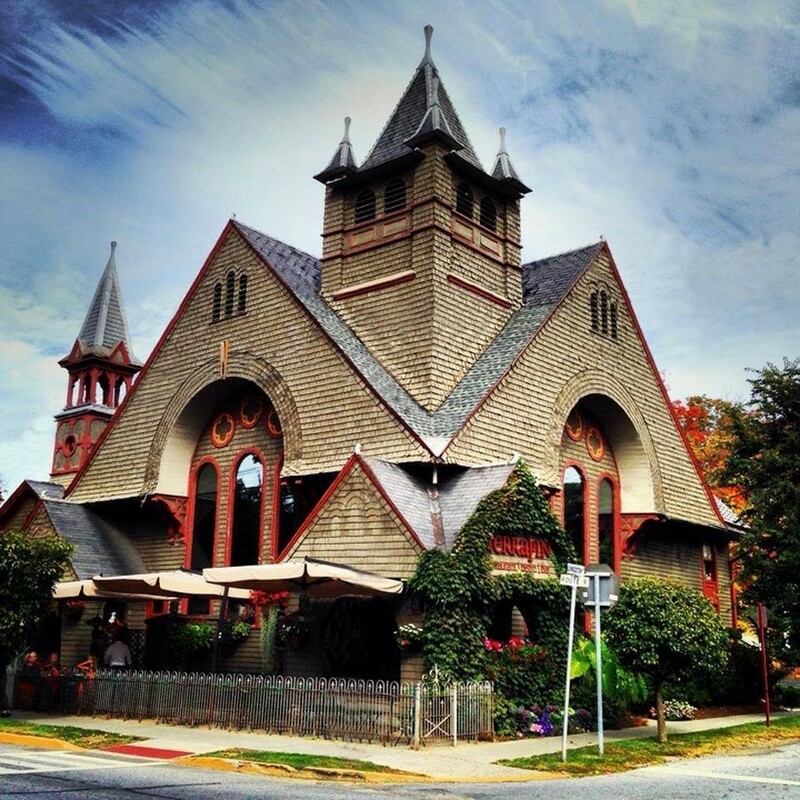 Luckily the Hudson Valley has no shortage of places to eat with awesome atmospheres and interesting architecture. Here are nine of the region’s coolest restaurant interiors for your next meal on the town. For restaurants with dope exterior settings, check out our post on 10 eateries with sweet outdoor seating. Surrounded by flowers blossoms, decorative string lights, and a bamboo roof, you’ll feel like you’re in an authentic Japanese garden when you step inside Yobo. Japanese artist Sasaki designed the interior to resemble a village square. Relax and kick off your shoes at the tatami table, and enjoy Asian fusion cuisine by the babbling brook that runs through the center of the restaurant. For years, an old, washed-up factory sat over the Fishkill Creek falls in Beacon—a storehouse of untapped potential. Once part of a complex of hydro-powered factories, the 200-year-old brick building was at various points a textile manufacturer, a machine shop, and a commercial dye house. In 2012, the facility was restored and extensively renovated, reopening as The Roundhouse—hotel and restaurant. Much of the historic building was preserved—exposed brick, repurposed wood, and high, wood-beamed ceilings with hanging lights make for a spacious, airy vibe. Now, you can take in the spectacular waterfall views through The Roundhouse restaurant’s bank of windows. On warm days, hear the gush of water and enjoy dappled sunshine when you dine al fresco on the open air deck. Located on the ground floor of this lively, boutique hotel, The Corner will have you dining in style. Between the Italian marble bar and table tops, kaleidoscopic starbursts Murano chandeliers, Berber rugs, modern artwork, and Mid-Century furniture accents, the hotel’s hip essence radiates into its farm-to-table restaurant and bar downstairs. Woodstock’s happening music venue is a neat place to grab a drink and some bar food. The small, intimate setting has a second-floor, wrap-around balcony where you can sit and eat above the din, or enjoy primo seats for a live music show. 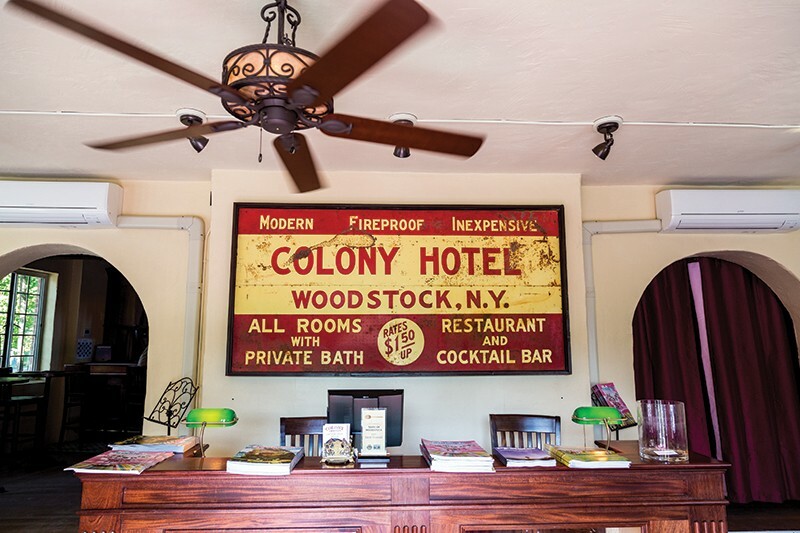 Colony was recently purchased by new owners and renovated. Its new incarnation has a lounge vibe with wood floors, chairs, and tables; and bulbous, orange string lights to tie it all together. This French cuisine, CIA restaurant is the perfect blend of comfortable and fancy. Sit back in one of The Bocuse’s stylish couches or cushioned seats equipped with armrests. As you do, admire the divine architecture—the textured, geometric design in the ceiling offsets the slim, circular chandeliers, all with the backdrop of a elegant cream-and-white color scheme. Okay, so there's no interior at the Rail Trail Cafe, but the set up is pretty awesome. If you’re more into outdoor comforts, this is the place for you. The vegetarian eatery has a full outdoor kitchen and is a hikers’ prime pit stop off the Wallkill Valley Rail Trail, which runs through the nearby village New Paltz. Take a break from your walk, run, or bicycle ride and grab some organic bites at the walk-up window. Then, eat at one of the long benches or round, cafe tables and enjoy the nature that surrounds you. 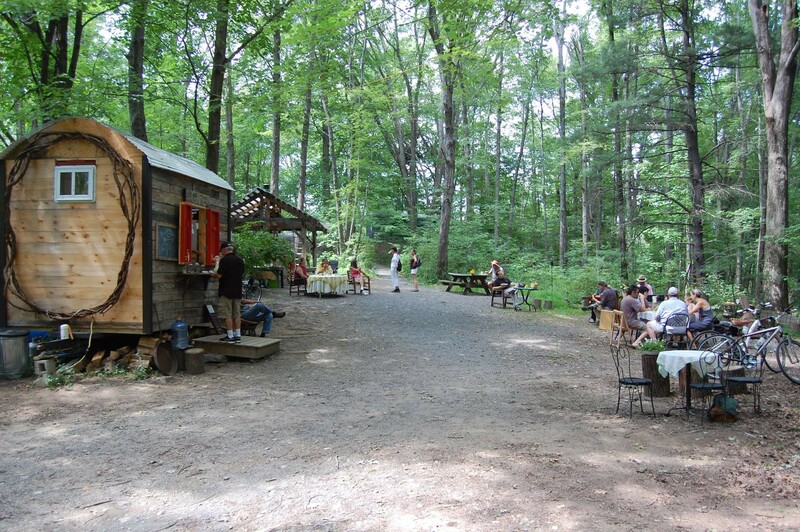 This casual wooded eatery also frequently hosts live music performances throughout the summer season, so you may just happen upon a set of local musicians. The exterior of this reclaimed church is impressive, reminiscent of a medieval castle with shrubbery and a gated patio for elegant outdoor dining. 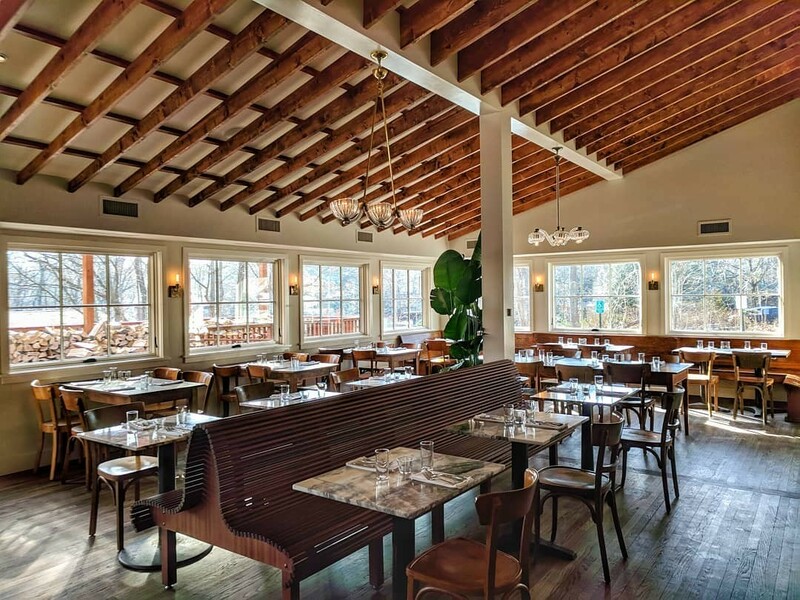 Inside, Terrapin is split into two sections: a grand dining room and a bistro lounge. The former church’s main hall is now an elegant, formal dining setting with modern lighting and tall, arched windows. To its left, Red Bistro offers a more casual dining experience where you can relax during lunchtime with beer and a burger. After undergoing a huge renovation last year, Silvia is one of the most newly updated restaurants in the region. Dine outdoors under the deck’s pergola or experience the hip vibes inside. Comfy leather and velvet booths line the walls beneath colorful collages of framed artwork. The center of the dining area is lined with long, elegant teak benches and lovely marble tabletops. The open kitchen lets you watch the culinary magicians at work as you wait for your meal. Phoenicia Diner is your retro, old school diner with a serious modern twist. The quaint exterior, topped with a huge DINER sign, calls to you from the side of Route 28. Once inside, you’ll find familiar retro comfort in the clear dividers, diner stools, and vintage black-and-white menu boards. 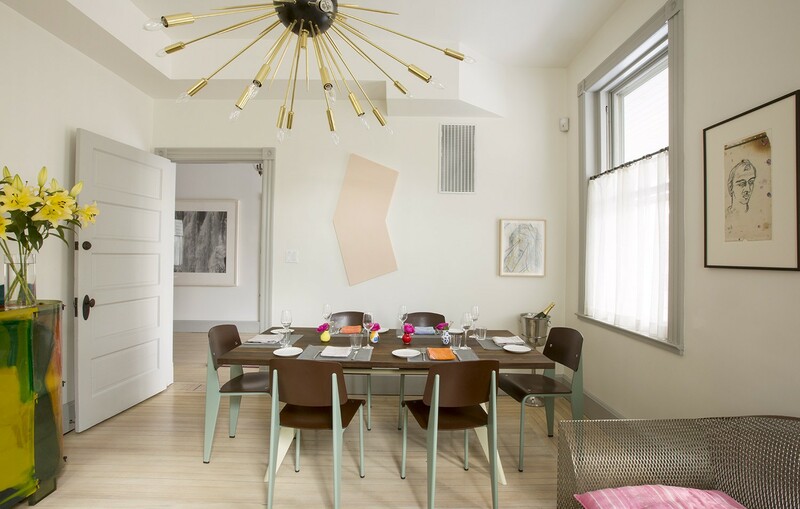 The contemporary feel emanates from chic hanging lights, a simplistic color scheme, and smooth, sleek countertops. Plus, the hipster-friendly diner is one of few to serve greasy spoon offerings with farm-to-table sourcing practices—the best of both worlds.